Sometimes I feel most alive when it’s relatively quiet, and I can just sit and listen to birds. I don’t know what it is about them. If I hear the sounds of birds that I heard in my childhood especially—and I can’t even identify the birds I’m hearing—it’s like something inside of me wakes up. And I’m happy. Any bird sound will do, though. They all awaken something. It’s usually the morning, of course, I’m listening to them right now, as I type. There are other sounds which don’t intrude, they almost fit, like lawn mowers when I was a kid, or a car or a truck now. I wonder what it is about birds. What is it that their sounds are tapping? 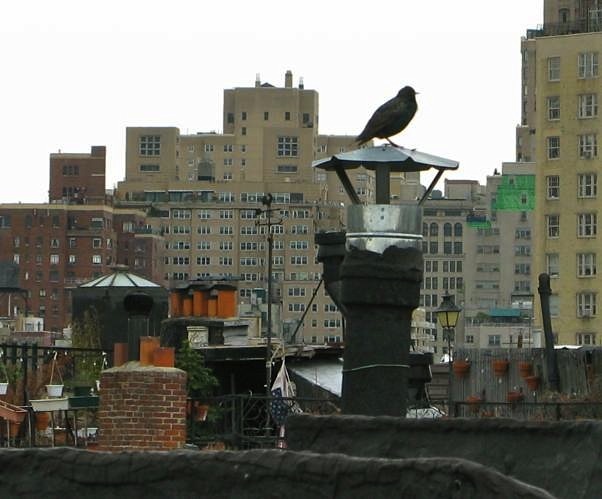 Nice shot of an European Starling on the chimney (or whatever that is). Did you know that starlings are related to mynas and have a huge repertoire of songs and sounds? I’m not crazy about them coming to my feeders in the winter time because they run off the little birds, but I do like listening to them. Starlings are one of my favorites to listen to! They always get your attention immediately. One, because they’re loud, and two, because they’re always making some interesting noise. But I’d feel bad for the little birds too.